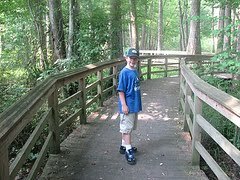 In June 2007), my son Tyler and I journeyed over for a short day trip to see the BREC Swamp sponsored by the parks department of Baton Rouge at Bluebonnet Blvd. I had heard about this place and been wanting to check it out. Anyway, above is a picture of Tyler and I hiking along the trail. The main entrance has a large air conditioned building where you pay your admission. The fee was $2 for adults and $1 for kids. I paid for us and we got a map and were off on our adventure hike. We hiked a good little ways and stayed to the left and saw lots of dense trees including some that had fallen. 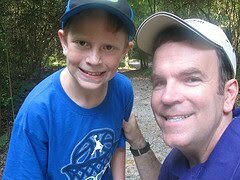 There was a lot of moisture in the hot humid morning so we both began to break a sweat fairly quickly. I stopped to get a picture of this cool looking red headed lizard that was climbing on a tree. That picture is on the right hand menu bar. It was an interesting adventure so far at the BREC swamp. We kept on hiking to the left and crossed several man-made wooden boardwalks in the portions along the hike that went over low lying areas that were filled with maybe less than one foot of water. These areas along the trail with the Cyprus trees and stumps certainly brought to mind my vision of what swamp land looks like. Below is a picture of Tyler walking across one of the wooden boardwalks. Anyway, as I said we stayed to the left and eventually ran into a dead end that led to the nearby library. There was a boardwalk and a screen door that was locked with the library parking lot right behind the door. So we turned around and headed back the other way. Since it was hot, this dead end part of the journey could have been left out. If you do go on this hike and the weather is hot, you might want to try to avoid this part of the trail that leads to this dead end. We hiked on back the way we came and then veered of to another trail which we had not traveled. As best that I could tell from our map, it would eventually loop back around and lead to the main building where we started. We walked a ways and came to a large pavilion that had a few picnic tables and a sort of observation deck area. A picture of this is on the right menu of Tyler looking out into the swamp from under this pavilion. After hanging out under the pavilion at the BREC Swamp for a little while we were both getting pretty hot and thirsty so we we ready to make our way back to the main building. If you go on this hike you might want to bring your own bottle of water. We made it back to the building and were glad to get a chance to cool off some. We got some water and then we made our way around to look at the various creatures that are on exhibit in that building. There was also a very huge python snake curled up in a large cage. The Bluebonnet Swamp has lots of snakes. This python was really big and Tyler was impressed. The BREC Swamp also does presentations for summer camps. There happened to be a summer camp group that was there at the same time we were. There was a young lady that was talking about the swamp and answering questions from the children. She also was letting the kids touch a small corn snake of which she was happy to let Tyler take a turn too. Our entire trip at the swamp was probably an hour long. I recommend that if you go during the summer to go early in the morning because of the heat. I could see that a nice cool fall day through the swamp could really make the experience a little more pleasant. Anyway, we both had a nice adventure on our day trip to the Baton Rouge's Bluebonnet Swamp.